Mortgage lending to home buyers picked up again in June, the Council of Mortgage Lenders (CML) says. Its figures showed that there were 52,000 new loans granted to home buyers, 19% more than in May and up 14% on the same month a year ago. The CML said activity was "still on an upward trajectory" and described the rise in June as "significant". However, the lenders' organisation said it was still cautious about the prospects for the coming months. "This is now the 12th consecutive month in which lending has been higher than its year-earlier levels," said CML economist Paul Samter. "But we still expect house purchase activity to be muted in the coming months. "Both consumer demand and lending capacity remain distinctly difficult to call, especially in the light of the government's austerity measures and their possible impact," he added. no. Is for house purchases. I'm surprised at this big rise, doesn't fit with all the other data about a stalling market and the fact that the big lenders face imminent funding issues (BoE SLS scheme, worht 200 bn, is ending next year). Where is the money coming from for these mortgages? Is it simply being funded by interest and capital being paid back on existing mortgages? Savings deposits are shrinking, securitisation is over, the government is withdrawing emergency liquidity measures .. I'm confused. How does it compare historically to boe lending panel and mortgage approval figs? 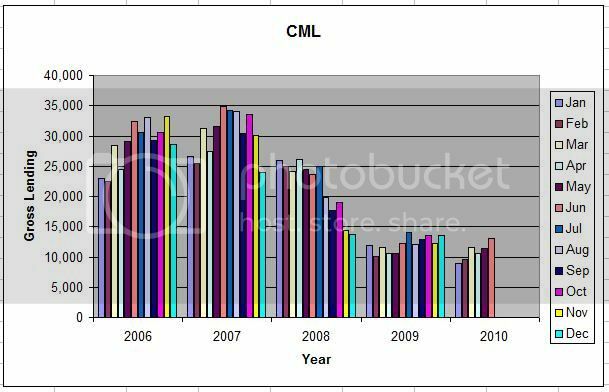 Its the CML, its June ( ancient history) and its CRACKAJACK! 12 months they will be kicking themselves. Bizarre - I have just read that remortgaging for June was 20% down on last yr and only 27,000. Me thinks there is the statistical massage parlour at work. Clearly, it is 'history' reported as if the applications were today rather than the previous month(s) when they were actually applied for prior to granting - since prices are definitely falling and that is now gathering pace to include almost everywhere, it is at odds with the current reality. Within the total, net lending secured on dwellings increased by £0.7 billion (Table A), slightly below the May increase of £0.8 billion and below the previous six-month average of £1.0 billion. The twelve-month growth rate was unchanged from a revised 0.9% for May. The three-month annualised growth rate increased to 0.7%, from 0.5% in May. The number of loan approvals for house purchase (47,643) was lower than the May figure (49,461) and below the previous six-month average (50,036). Approvals for remortgaging (24,949) were lower than in May and also lower than the previous six-month average (26,366), while approvals for other purposes (24,849) were in line with May but below the previous six-month average of 25,069 (Table . I've heard it said that the British housing market is stable at about 70,000 transactions a month (it topped 100,000 in indivudual months during the most frenzied years), so even though these latest figures are up, they're still well down on long term trends. In other words it's still evidence of a subdued market, and evidence that "pent up supply" is probably increasing! Between Fixed rates, Capped rates and Tracker/Discount rates*. Of First Time Buyers compared to all Purchasers. The latest www.charcol.co.uk mortgage index reveals that 6 out of 10 mortgages taken in June 2010 were for purchases. ....if this were true and the BofE and CML were based on completions why are they so different..CML says numbers up ...BofE says numbers down..? ....if this were true and the BofE and CML were based on completions why are they so different....? The figures from the BoE you linked to come from a Table named "Table B - Approvals secured on dwellings". The BoE figures are definitely approvals. Also, the NSA/SA makes a huge difference. 1. Total gross lending gives the total value of loans secured on dwellings that are newly advanced by institutions in the period. All the figures were sourced from the Bank of England except the estimate for the most current month. 2. The CML estimates of gross lending for the latest month were based on the lending figures provided by a sample of lenders that represent around 80% of the mortgage market. The aggregate of these figures were scaled up to represent the whole market. Yay, go 2010, go go go. Oh! And that's with the special liquidity scheme in operation!